Martha wasn’t wrong as she prepared a meal for the Lord and His disciples. Quite likely, she was listening even as she worked to make ready and serve the food. Yet she seemed completely unaware that she was fixing a meal for the Host of the everlasting banquet. What earthly provender compares to this “feast of rich food” and “well-aged wine” (Isaiah 25:6) that awaits us when we are raised from the dead? Martha was concerned with her guests’ daily bread. But more essentially, Mary wanted first to partake of the “good portion,” feasting on the Bread of Life (see John 6:48, 51) as He taught in their home. Text: Now as they went on their way, Jesus entered a village. And a woman named Martha welcomed him into her house. And she had a sister called Mary, who sat at the Lord’s feet and listened to his teaching. Audio: Click to hear the MP3 of One Thing Necessary. 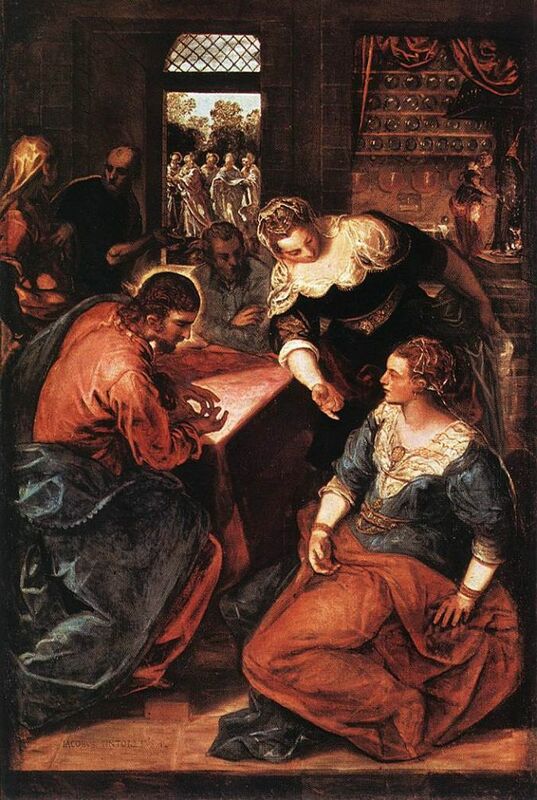 Illustration: Tintoretto, Christ in the House of Martha and Mary from the Web Gallery of Art.